I'm a pretty good pantry scavenger when our fridge is running a bit low on fresh ingredients. We pretty much hit that point with no milk, eggs or bread in the fridge and a lot of empty shelves. What we did have, however, counted in spades. I can't remember what exactly drove me to think of making a pumpkin bisque, but we just happened to have all of the ingredients on hand. I improvised a bit to give it a bit more of a spicy kick, so I'll claim this recipe as my own. Melt the butter in a pan and saute the onion, celery and garlic until just softened. Add stock, tomatoes with liquid, bay leaves and nutmeg. Simmer about 30 minutes. Remove the bay leaf and strain the vegetables. Place them into a blender or food processor with enough of the liquid to cover. (I cheated and poured the entire pot into our 7-cup Vitamix, then carefully poured most of the liquid back into the pot.) Puree the mixture, then add it back to the pot. Add the pumpkin and remaining spices to the mix and heat thoroughly, then finish with the cream. Serve immediately. This recipe should make about 5-6 servings and is great for cold fall nights. If you prefer to use fresh ingredients, substitute 2 cups of tomatoes and 2 cups of pumpkin puree for the canned items. I'd also recommend playing around with the seasonings to fit your own tastes (sage, perhaps? ), though what we ended up with was savory with just enough kick to remind us that pumpkin isn't just a dessert gourd. 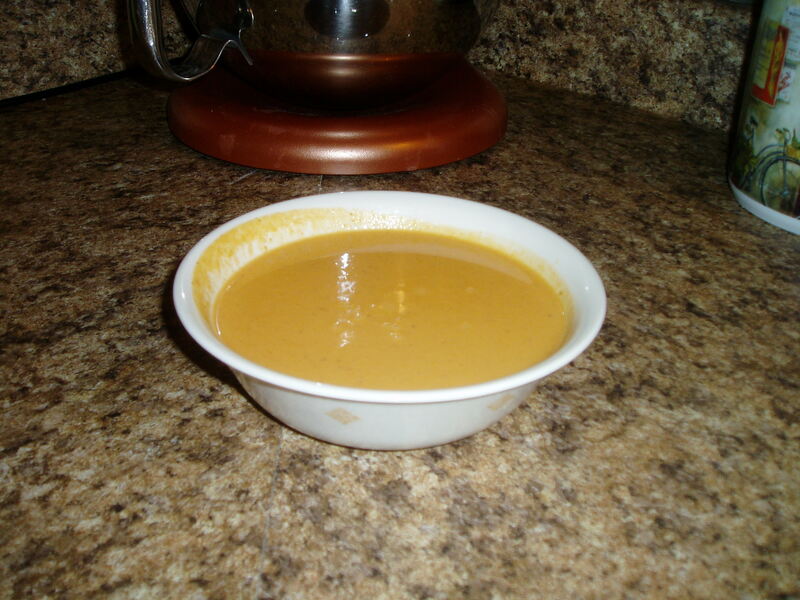 I’m sure your soup was yummy, but I have to tell you it is the exact colour of newborn poop when it gets to the mustard-like stage. You’ll see soon enough. Wait, you didn’t have milk or eggs, but you had a cup of heavy cream? It’s striking me as odd, for some reason. We had gotten it for a sauce that we never ended up making and heavy cream lasts for a very long time (usually 5 weeks or so). Mystery solved. That sounds awesome. I like the idea of the nutmeg and cinnamon in a savory soup. Oooh! I’ve been considering a pumpkin soup! I have a medium sugar pumpkin (the smooth, very round, table setting variety) that was never painted nor carved. Do you think if I bake it for a while the meat would be any good for a soup base? A sugar pumpkin should work fine. In fact, any pumpkin that wasn’t intended for carving should do the trick.